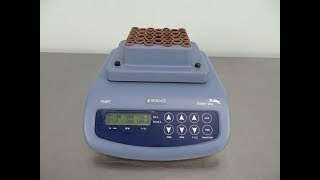 The BOEKEL Grant Bio PHMT Thermoshaker provides a compact and effective solution for shaking and incubating microtubes and plates. This lab shaker has a low-profile design, and is built for use in cold rooms and incubators within an operating range of 4-40°C. The PHMT has a speed range of 250-1400 rpm with a 2 mm orbit, adjustable at the digital control panel, along with time and temperature. The temperature control range of this thermoshaker can be set from 5 above ambient to 100°C, heating up at 4° per minute, and can be used either continuously or with the timer feature up to 96 hours. This incubator shaker also features a soft start to limit jostling and bumping of samples. The Grant Bio PHMT can be used to speed up throughput for many applications, and with the powerful and quiet motor, this flexible workhorse will serve the lab well. This BOEKEL Grant Bio PHMT Thermo Shaker (Thermomixer) has been fully inspected and is operating without issue. All of our lab equipment comes backed with our standard warranty. Should you have any questions about this or our other incubator shakers, please don't hesitate to contact us.